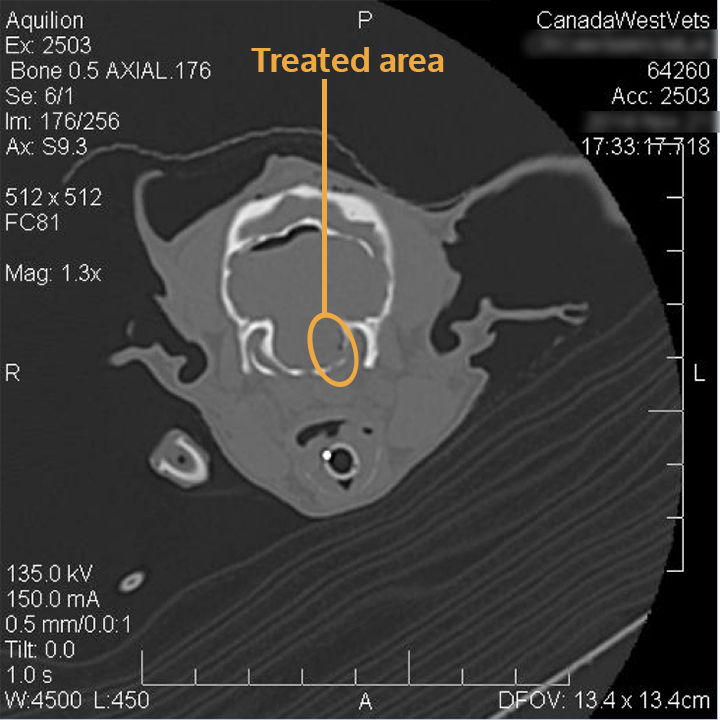 Our case reports series discusses actual cases treated at Canada West Veterinary Specialists to help pet owners better understand our work and some of the processes and stages involved. 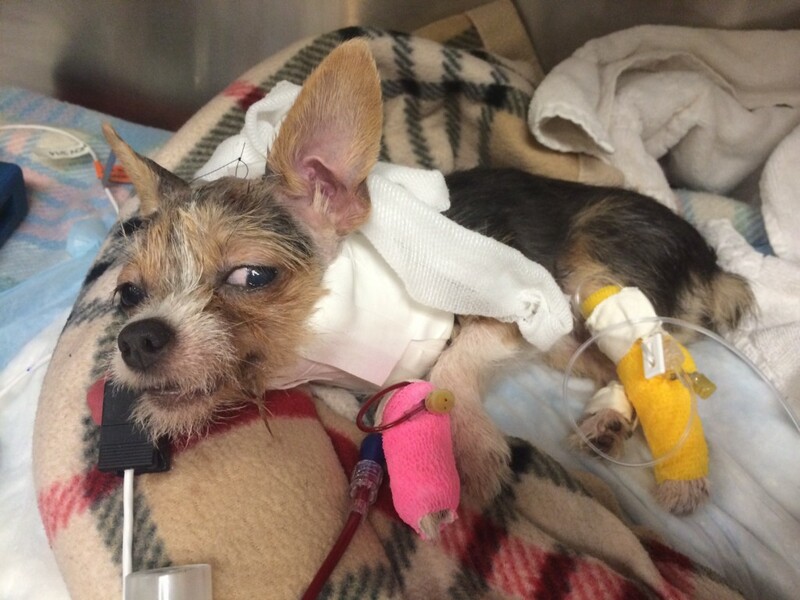 This profile features Mija, an 8-month old terrier pup who recently underwent brain surgery at our hospital. No one knows exactly what happened to Mija. All her owners know is that they found their tiny (1.5 kg) terrier pup with a big dog standing over her, clearly in distress. Mija was rushed to her family vet, who examined her carefully. There were bite marks over the back of her neck. She couldn’t stand but would just roll over and over; her head and neck were severely tilted to the left. Her left pupil was also smaller than her right, her eyes were constantly flicking from side to side, and mentally she was dull and not the normal, bright puppy that she had been to that point. Her family vet also noted that she had abnormal leg reflexes on her left side. Over the next few days, while her mental alertness improved a little bit, but she was still not bright and responsive, and she remained twisted to the left and completely unable to stand; she would continue to roll onto her back if she struggled to try and stand. She could move all of her legs, but her left front leg was very weak. She was referred to our neurology service to find out more about her condition, and to see if there was anything more that could be done for her. In neurology, the first job is always to “localize the lesion”; that is, to figure out where exactly within the nervous system the damage must be to account for the abnormal neurologic findings seen. The first step is a complete neurological exam, checking all the reflexes for every part of the body to check for normal function of nerves, spine and brain. Mija had no normal postural reactions in any of her legs except her right rear, although her spinal reflexes were all okay. She also had several abnormal cranial nerve reflexes: her left pupil did not constrict normally and she had decreased feeling by her left nostril. She did not however show any evidence of being painful over her neck or back. The neurologists determined that a lesion in her left brainstem would explain her dull mental state and most of her abnormal reflexes. Her eyes flicking from side to side (a condition known as “nystagmus”) was likely due to damage to her left cerebellum. The fact her head and neck were severely tilted to the left (a medical sign known as “torticollis”) suggested a left cerebral cortex injury. Having localized her lesions to multiple areas of her brain based on her abnormal neurological responses, the theory was that she had been bitten in 2 places in her brain – A bite in the left brainstem and probably also her left cerebellum. The next step in assessing Mija was for her to have a CT scan. This is the best way to see if any of her skull bones were broken. Sure enough, she had two broken bones in the back of her skull that were pushing down into her brain. Next, Mija had an MRI, which is a better way to look at the brain itself. The MRI confirmed that the brain was compressed in these areas, over her left brainstem and cerebellum, which fit with the lesion localization from her neurological exam. At this point, our neurosurgeon Dr. Sharp and Mija’s family had a big decision to make. 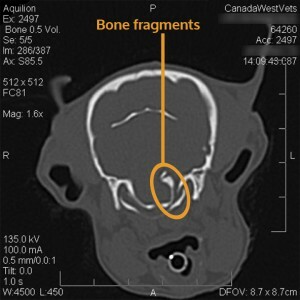 Would it be better to remove the pieces of bone, knowing that the brain surgery carried a high degree of risk? It could potentially worsen her condition; she might not even survive. Even if she did survive the surgery, would her brain be able to recover from the damage? However, the alternative option of leaving her to try to get better with the large pieces of bone compressing these parts of her brain was not looking very positive, as there had been no signs of improvement so far in her ability to sit upright or stand. Everyone involved wanted to give Mija the best chance of improving, and her family decided they would accept the risks of surgery in hope of a favourable outcome. Mija did very well under anesthesia while Dr. Sharp removed one large piece of bone from her brain that measured 1 cm in length (to put this in perspective, her entire brain is only 5 cm long). 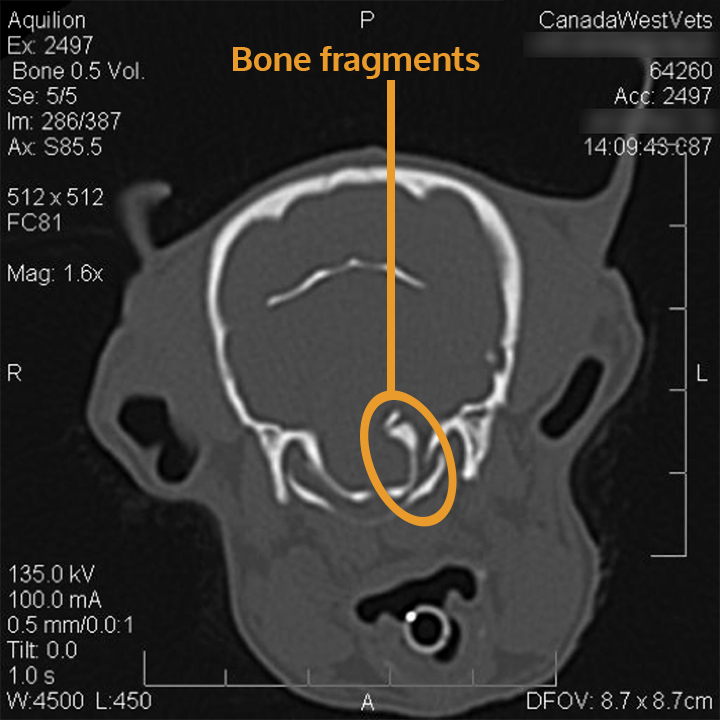 Dr. Mareschel, our radiologist, suspected that there was still one more piece of bone left based on her pre-surgical CT scan. Dr. Sharp continued to search and he then removed the remaining fragment of bone, which was the occipital condyle, a part of the skull that connects to the top of the spine. This piece was also 1 cm long! Because this area was likely to be unstable, the surgeon made Mija a neck splint, with the hope that eventually scar tissue would develop in the area to help stabilize it. Mija recovered well from the anesthesia, and by the next day was, at least, no worse than before surgery. Mija recuperated in hospital over the next few days. By the time she was ready to go home, she was eating well. She hadn’t developed any complications, although she had a bit of a cough, and was checked with chest radiographs to rule out pneumonia. We decided to remove her splint because we wanted to make sure that she could eat and swallow without difficulty and she was not in any pain without it. Dr. Sharp felt that because her brainstem was likely compressed for 6 days prior to surgery, it could take weeks to months for her to show significant improvement. However, she was already able to sit up and move her head to look around. Mija went home 10-days after surgery and she began to hold her head straighter. While she was home, Mija needed to be kept very quiet and still, making sure she was turned from side to side at least 4 times a day. Even if she were to start to move around more, it was important that her family made sure that she did not fall or injure herself, so no stairs or jumping on furniture, and no running or playing with other dogs. We had shown her family how to help Mija with physical therapy exercises. Mija’s owners sent us a video of her progress one week after going home. At this stage Mija’s mobility was improving, although she still was very restricted in her movements. By 4-weeks after surgery Mija was starting to walk on her own though she was still wobbly. Dr. Sharp was delighted with Mija’s progress and is optimistic that she will improve further in the weeks and months ahead. Mija will never be the same dog that she was but we are proud to have been able to help her recover to the extent possible given her injuries.